This EA is not about constructing a mine. It is only about permitting exploratory drilling. The Forest Service says the total proposed disturbance from all exploration activities is estimated to be 13.9 acres. Wildcat Silver says some of what is counted as disturbance includes lands already disturbed as existing roads. An informational public meeting will be held on Monday March 24, 2014 from 6:00 to 8:00 p.m. at the Patagonia High School Cafeteria, 200 Naugle Ave, Patagonia, AZ. On its web site, the Forest Service announced that the "purpose of the meeting will be to provide an update on the proposed project, a summary of the draft analysis, instructions on how to comment on the Draft EA, and a summary of the analysis process. A short question and answer session and an open house will follow. Coronado personnel will be available to answer questions. Comments will not be solicited at the meeting." However, on Friday, Wildcat Silver announced at the Arizona Mining Alliance luncheon that the Forest Service was now making the event an "open microphone" format, with a first-come, first-to-be-heard agenda. 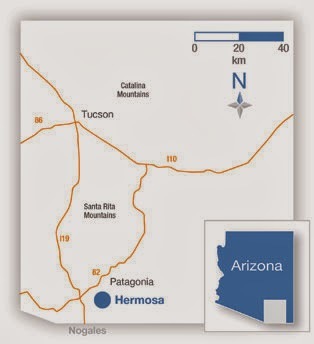 The question starting to be heard is whether the region's mining opponents will shift their focus to the Hermosa project now that the Rosemont copper project increasingly appears to be on the final path to approval.